This deal is nuts, in the best possible way. 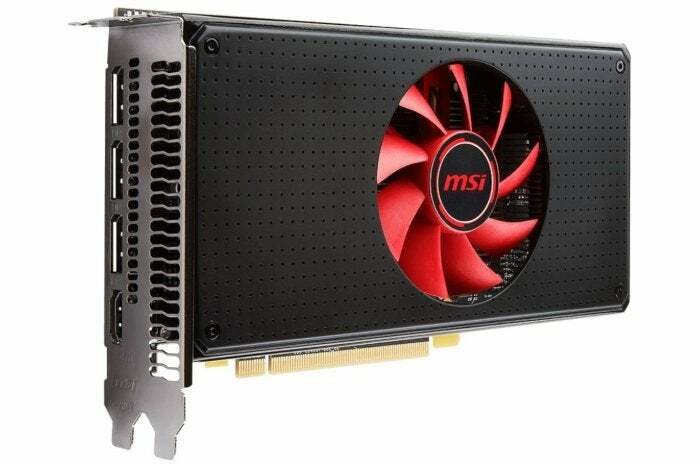 Today, Amazon’s selling an 8GB MSI Radeon RX 580 for $230Remove non-product link after a $30 mail-in rebate, plus you get a $25 Amazon gift card. This deal is nuts. You can't even find a 4GB card for $230 in most places. This is the third great RX 580 deal we've seen this month, but the best of all for sure. Doing the math for you, this deal makes the up-front cost $260, with an overall rebate of $55 if you count the gift card as money in your pocket. Don't dilly-dally, either. It’s not clear how long you’ll be able to get this RX 580 at this price and with the $30 rebate, but the gift card offer ends on July 31. Note the fine print, which says: "Gift Card must be added to Shopping Cart, and offer will be reflected at Checkout." Also, need we say, it's always a good rule to mail in your rebate ASAP before you lose the receipt, miss the deadline, or otherwise bungle the offer. MSI’s RX 580 8G V1 has a single-fan design and a dual-slot width. It has 2,304 stream processors, and a boost clock of 1,340MHz. The base clock is not listed, but the reference design calls for the speed to be around 1,257MHz. For ports, it has one HDMI 2.0b and three DisplayPort 1.4 inputs. For performance, the RX 580 is generally a great choice for 1080p gaming at 60 frames per second with all your settings cranked. For 1440p gamers, you can get decent performance with this card, and you can get entry-level VR performance as well.